Dan had a wonderful 7 days in São Paulo from November 11th to the 18th. He attended the Brazilian General Conference, preached in several churches, and met with national leaders and fellow missionaries. The theme of the conference was “United to Reach This Generation”. Conference sessions included praise, preaching, testimony, reports, and administrative decisions. Bishop Ildo was re-elected for a 4-year term by an overwhelming majority vote. 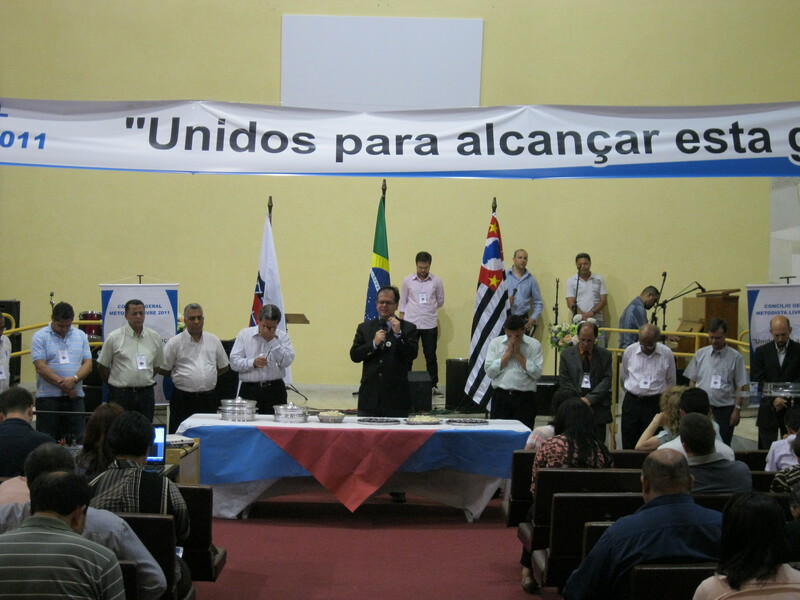 Dan was blessed to see many of our friends from the Northeast and West Central Brazil. It was marvelous to hear that the church is growing stronger and looking toward new horizons of ministry for Christ’s eternal Kingdom. Dan was also able to participate in the planning stages for two initiatives in the ministry of the Brazilian church: a church plant in Brasilia, the nation’s capital, and a worship arts teaching and praise impact ministry event to be held in August of 2012. Furthermore, he was able to give missiological input to the work of the Brazilian church in their initiatives in Angola and Burkina Faso. He is grateful to the Lord for every detail of his trip: the hospitality, the important contacts, safety, and even the opportunity to attend a pro soccer game being played by his favorite team! We are thankful Dan could take this wonderful trip. We are grateful, too, for the prayers that are continually offered on our behalf and on the behalf of the Brazilian church. God is answering!